Is there a parent who hasn’t seen: ‘The Land before Time’ cartoon? We have all been there. Now it’s time to show your kids the real thing and the life-sized dinosaurs in Dino World Plzen are a great educational way to do so. It has a few playgrounds, a Zip-Line and a 3D cinema as well and it is great fun for the whole family! We had no idea that it even existed and it was only by chance while we were visiting Plzen Zoo (45 km from Prague), with the boys, that we ‘bumped’ into it. 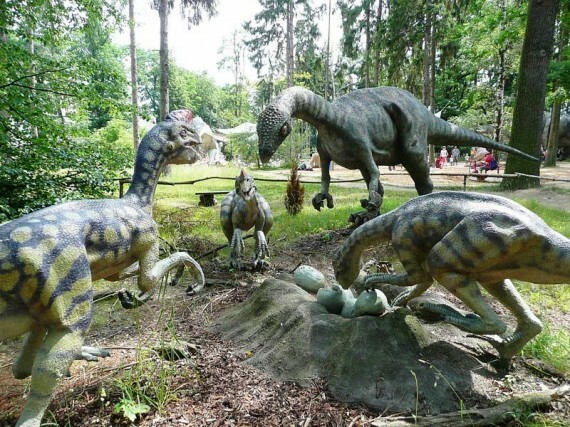 Dino Park Plzen is directly connected to Plzeň Zoo and you can either visit just one of these attractions or combine the two for a reduced price! There is so much to see and do, that you could easily spend half a day here. The playgrounds have been set up to accommodate both small and big kids, there are refreshment kiosks and The DinoPark ticket even includes a visit to the unique 3D cinema. This cinema runs a three-dimensional film called “Giganotosaurus” all throughout the day. Polarization glasses are lent to all the visitors free of charge. The film presents a story of a young dinosaur who manages to survive in the wild and inhospitable Jurassic era. The entire film (including music and commentary) was made exclusively for Dino Park and you can’t view it anywhere else. Even though it is in Czech, it is still worth seeing, if just for the visual effects. There are 2 ways to enter Dino Park: either directly by the upper entrance “Vinice” or through the main lower gate of Plzen Zoo. The purchase of one ticket valid for both the Zoo + Dino Park is the most price effective. If you buy a ticket for the zoo only, you can still purchase the other ticket later, but there is no price reduction. My boys were totally awe-struck and literally stopped walking when one of the dinos suddenly started roaring at them. Standing there, I realized I have to be more prepared to educate them, and next time when we go I have to have a list with the names and types of the Dinos that we’re looking at with at least some basic information about them. I searched the whole web and created a concise list of the main Dino types. This way you will be THE mum or dad of the day when you go there. In order to stay one step ahead of our kids, I think that it’s important that we educate ourselves too. So here you go! T-Rex (we all know): was a huge meat-eating dinosaur that lived during the late Cretaceous period, about 85 million to 65 million years ago. T-rex lived in a humid, semi-tropical environment, in open forests with nearby rivers and in coastal forested swamps. Tyrannosaurus Rex was up 12.4m long and about 4.6 to 6m tall. Their arms were only about 1m long. Tyrannosaurus Rex was roughly 5 to 7 tons in weight. T. Rex fossils have been found in western North America and Mongolia. Brachiosaurus: is one of the tallest and largest dinosaurs found. Brachiosaurus was about 26m long, and weighed about 33-88 tons. It had a claw on the first toe of each front foot and claws on the first three toes of each rear foot (each foot had five toes with fleshy pads). Brachiosaurus lived in the middle to late Jurassic period, about 156-145 million years ago. Brachiosaurus and some of the other large sauropods (the huge long-necked plant-eaters) needed to have large, powerful hearts and very high blood pressure in order to pump blood up the long neck to the head and brain. Its intelligence (measured by its relative brain to body weight, or EQ) was the among the lowest of the dinosaurs. Coelophisis: meaning Hollow Form was about 2.8m long. Coelophysis lived roughly 210 million years ago and it was one of the earliest-known dinosaurs. Their fossilized stomach remains have been found containing small reptiles, fish, and other Coelophysis bones of different sizes, indicating that it was a cannibal. Coelophysis was a very fast runner. Edmontonia: was a large, plant-eating, duck-billed dinosaur from the late Cretaceous period. Edmontosaurus was a slow-moving dinosaur with few defenses, but may have had keen senses (eyesight, hearing, and smell) to help it avoid predators in its swampy habitat. It lived about 73 to 65 million years ago, toward the end of the Mesozoic Era. It went extinct during the huge K-T mass extinction. T. Rex was one of its contemporaries, and may have preyed upon it. Fossils have been found in Alberta, Canada, and Alaska, Wyoming, Montana and New Jersey in the USA. Two mummified fossils were found in Wyoming, USA. Stegosaurus: was up to 8-9m long and Its small brain was only the size of a walnut. The function of its back plates is uncertain. The plates were made of bone which were not solid, but filled with tube-like tunnels. The largest of these triangular plates was about 76cm tall and just as long. The plates were probably well-nourished by blood vessels, indicating that they may have been used to regulate the dinosaur’s temperature. They may have also been used for protection or mating display purposes. Oviraptor: meaning the Egg Robber lived about 88-70 million years ago. It probably ate meat, eggs, seeds, insects, plants with its beak and powerful jaws. It was thought to eat mostly eggs. The Oviraptor was a relatively large-brained dinosaur that cared for its own eggs. Looks like they learned from the best! Triceratops: lived about 72 to 65 million years ago, toward the end of the Mesozoic period, the Age of Reptiles. When threatened by predators, Triceratops probably charged into its enemy like the modern-day rhinoceros does. Triceratops were hunted and eaten by T-Rex alot. Triceratops were herbivores (plant eaters). Parasaurolophu: the Crested Lizard weighed about 2 tons. It had pebbly-textured skin, a spoon-shaped beak, and a pointy tail. Its sight and hearing were keen, but it had no natural defenses so was not a good fighter. It used to be thought that its crest was used as a snorkel-like device, indicating that the animal spent much time in the water, but since the crest has no nostril at the top, this theory has been dismissed. Pachycephalosaurus: the Thick-Headed Lizard grew to be about 4.6m long and may have weighed roughly 430kg. They lived during the late Cretaceous period, about 76 to 65 million years ago and also probably had a good sense of smell. Running was probably the first line of self-defense. Its huge head housed an incredibly thick skull, a tiny brain, and large eyes. Its rounded skull was up to 25cm thick. I know there are many more, but this will do as a lecture to your kids. They will probably run off to the playgrounds after the first atemp to educate them but it is good to be ready! The Dino Park even hosts the very rare and unique ‘Wollemi Pine’. This plant actually grew and existed at the time of the dinosaurs (more that 175 million years ago) and is the oldest plant in the world. 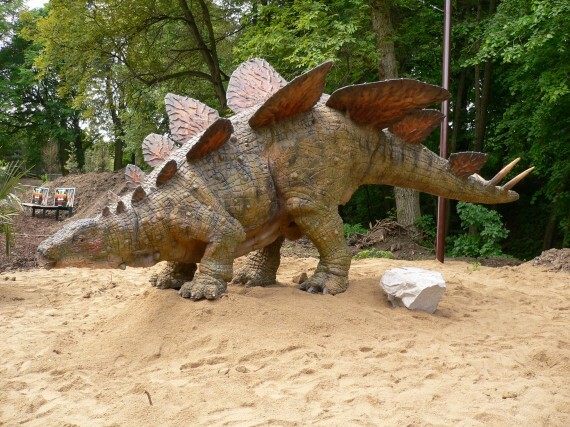 It has been here at the DinoPark since 2006. This Mesozoic tree is a prehistoric pine which was first discovered in Australia in 1994. Currently, only 39 specimens of this plant grow freely in the Australian wilderness. For a botanist to see this plant, the feeling is the same as that of a zoologist coming face to face with a live dinosaur! For real Botanical facts, we can learn more here. 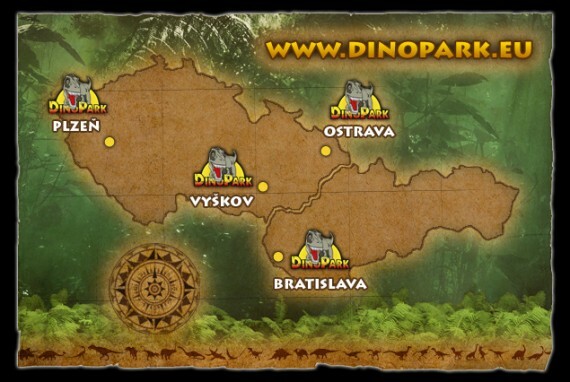 There is a total of 3 Dino Worlds in Czech republic in: Pilsen, Ostrava, Vyskov and one more in Bratislava, Slovakia. DIRECTIONS: From Prague take the D5 to Plzen (Pilsen) passing IKEA on your left and Metropole Zlicin on your right. The D5 is a highway all the way to Plzen and the drive is very smooth. From the town centre follow the signs to “Karlovy Vary” and then turn into the “Vinice” district when you see a complex with Mc Donalds and Ceska Sporitelna bank on your right. You will then have to drive through the whole town of Plzen. When you take this exit you might start feeling like turning back because you appear to be in the middle of nowhere but don’t worry, keep going and then suddenly Plzen Zoo will appear in front of you. If you drive around you will make it to the upper Entrance to the Dino World.